Hi, I just switched from unity to xubuntu. So now I am cusomizing xfce to looks like unity. 1) windows list panel is too small, I would like to have something like with 200 or 300 px of width. 2) my new "unity luncher" doesn't dodge maximized windows. Would be nice to have this option. While browsing or clicking the X button to close a maximized the panel window pops up... I am on a 13 inch laptop, so every pixel counts. Have a look at this page. Specifically the section of XfceTasklist and the menu-max-width-chars variable. For 2) use the Settings > Panel > Display tab > "Automatically show and hide the panel" options, including the "Reserve space on borders" checkbox, and tweak to your liking. Thanks for your reply. I am kinda noob. # The maximum length of a button before the label ellipsizes. # Ellipsizing used in the task list and overflow menu labels. # hide the icon) and 100 (don't lighten the icon). to /usr/share/themes/Adwaita/gtk-2.0/hacks.rc (using Aswaita and refeshing the theme switching from this to another one) nothing happens. About #2, the "intellihide" doesn't do the trick. 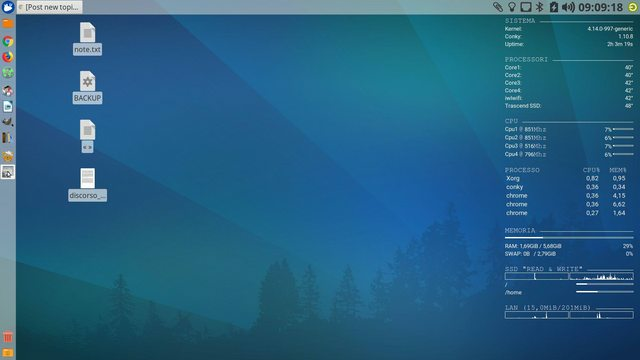 I tried the dock named PLANK and it has the feature I am looking for (dodge maximized windows) BUT i cannot positioning the dock under the top panel... so I will stick with the default panel. What am I doing wrong editing the theme? I'm not so sure, but I think the file you have to modify (create if it doesn't exist) is ~/.gtkrc-2.0 (that is, for example: /home/ibart/.gtkrc-2.0). #1 Solved... I needed a reboot. The simple switching theme trick doesn't work. #2 it is not what I am looking for. I need an option to dodge the window, like "do not reveal if a maximized window is on the way". Thanks anyway. I am not sure what you mean. Do you mean for the panel to not cover the maximized window (in other words, to "not reveal" itself) when you maximize that window? Because that's what NOT checking the "Don't reserve space on borders" option when you set the auto-hide option to never (and, I would guess - but am not sure - the "Intelligently" option) does. If that's not it... I do not know how the panel can change its behavior between the moment that a window is in an unmaximized state and the moment it is in a maximized one - which would seem to be what the words "a maximized window is on the way" mean. Again, I am not sure that I am understanding what you mean. Although I am more ignorant than most, here, it is possible that others may also be unsure of what you mean - and, if that is the case, it could be causing some delay in one of them figuring out what the correct answer to your question is. So... can you clarify, please? MDM, yeah: Ibart, could you clarify about that? And on #1, the changes were on /usr/share/themes/Adwaita/gtk-2.0/hacks.rc or ~/.gtkrc-2.0? Because I think there's a difference, the 1st would apply to the Adwaita theme, for all users, the 2nd for your user, across themes, wouldn't it? You are right. I edited just that theme, but I will modify the file globally. If I maximize a window the deskbar disappears (with intellihide). I would like to have the deskbar always hidden BELOW/BEHIND any window... so even if I move the mouse over the deskbar (which is hidden by maximized window) I would like to have it hidden. In my opinion, the trigger that activate the deskbar has to have a switch to turn itself off. I'm not sure if you can get exactly what you want without tweaking those properties. Great trick. Changing the XfcePanelWindow::popup-delay to 3 seconds does what I need. There is still a thing that annoying me, even if I am more than satisfied with xfce. I don't like how icons in my new unity-like luncher reacts to a click. After a click the luncher creates a new instance but (for example the browser) if the application is already started it would be nice to have the deskbar maximing the already running process. Anyone, thank you very much for your help. Bye! There is still a thing that annoying me, even if I am more than satisfied with xfce. I don't like how icons in my new unity-like luncher reacts to a click. After a click the luncher creates a new instance but (for example the browser) if the application is already started it would be nice to have the deskbar maximing the already running process. I have it available (but not installed) through the WebUp8 PPA. I think it does what you want.